The Jim Russell Driving School is a professional karting academy, where the training is supervised by the cheif instructor Ben Cooper, a Multiple Karting World Champion, and our experienced instructors. We offer a range of coaching programs, for individuals or groups and fine tunning of experienced drivers. All of our coaching programs include a theoretical session on driving (racing lines, braking points, apex, overtaking techniques), an on track practice and end with a personalise debriefing by our instructors. We offer a variety of coaching options to suit your needs. Training is performed in a safe environment and conducted by experienced driving instructors. 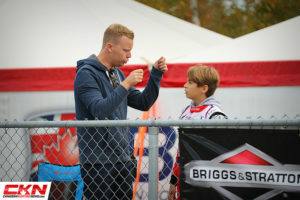 Cadet Karting and Rotax Max Karting is a great way to introduce people from age 7 onwards into competition karting. Rotax Max Karting is the largest Karting Formula in the World and certain models, in the Rotax family, will reach 150km/h, accelerate from 0 to 100km/h in less than 4 seconds and can pull up to 2G’s while cornering. When completed successfully, these courses will enable you to apply for an official competition karting license and access to races and championships.